BleachHouseLibrary.ie: #IrishFictionFortnight - Day 2 - 'Butterfly Barn' by Karen Power. 2 copies to giveaway. 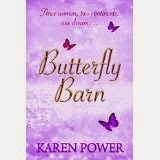 #IrishFictionFortnight - Day 2 - 'Butterfly Barn' by Karen Power. 2 copies to giveaway. Thanks to the author, I have 2 paperback copies of her debut novel to giveaway. Grace Fitzgerald hopes to sign a contract with an American cruise corporation to bring cruise liners to the idyllic coastal town of Bayrush, in Ireland. Her fiancé, Dirk, doesn’t seem to grasp just how important the business is to her. On her way through Dublin Airport, Grace catches a glimpse of Jack Leslie, her first love. He’s married now but he still has the power to turn her knees to jelly. Grace is about to make the biggest decision of her life. Will it be the right one? Jessie McGrath is happily married to Geoff, and together they run a small equestrian centre on the outskirts of Bayrush. Jessie is finally pregnant with her second child, and life couldn’t be better. But will their dreams come true or will they fall to pieces? Sophia Wynthrope can’t escape the emptiness of widowhood. After thirty-five years of marriage New York holds too many memories of her treasured husband. Is she chasing foolish dreams by travelling to Ireland, or can she possibly find the peace she craves in a place called Bayrush? Just enter via rafflecopter link, below. Open INT. PS I Love You is such a beautiful story! ps I love you as was pregnant and can remember sitting in my caravan laughing and crying at the story.